Most people throw everything but the kitchen sink into finding that perfect undereye concealer. When tackling dark circles, we adhere to the standards of trying to get enough sleep, cooling gel eye masks, vitamin K, and a plethora of eye creams promising to diminish those pesky bluish gray half moons. Unfortunately, even the most disciplined routine for undereye care doesn’t seem to get rid of them completely, and the truth of the matter is…….nothing really will. Dark circles are just obstacles we have to live with. They are hereditary in most cases, they can be a result of too much sun exposure, thinning of the delicate skin around the eye, and they can even be an indication of liver disease; in most serious cases. That is why a few blessed souls invented concealer, to fix what nature can’t seem to. Lydia O’Leary was the genius behind Covermark, which was the first foundation to be patented here in the US in 1928. In 1936 she launched her spot stick, the first concealer! An infinite number of concealers have been created since then, and I personally cannot even count how many I have tried, but out of them all, this new concealer stands against the rest. 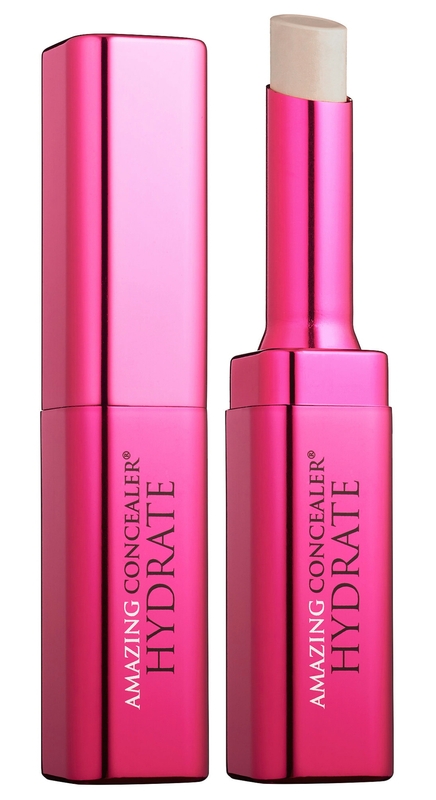 Introducing AmazingConcealer from Amazing Cosmetics! This is everything you could want in a undereye concealer. Technically you can use this all over your face, and it would be great to use on areas that may have fine lines since it doesn’t settle into creases. It in fact plumps the areas where it is applied, thanks to hyaluronic acid. Moisturizing micro oils ensure the skin does not dry out throughout the day. I would describe this as a medium coverage concealer, although you can certainly layer it on thick, and I mean thick! It blends seamlessly! That is perhaps the best thing about this product, if you overapply a bit you can’t tell. I tried to and my eyes didn’t look cakey at all. This comes in a great range of 10 shades. I use the ivory, which is the lightest shade and has a slightly yellow undertone. My eyes look fresh and bright from the time I apply until the time I take it off! I can’t say enough about it. My search is over for the best undereye concealer! My eyes can rest easy for now!